Marketing is evolving rapidly, and becoming more complex for manufacturers of all types. At the same time, traditional marketing is becoming less effective, if not obsolete. So what are the most effective marketing initiatives and tactics for manufacturers? Following are 5 Keys to marketing success for manufacturers including branding, digital excellence, content, lead generation, and sales support. When the author started his career, advertising, collateral (ala brochures/catalogs), publicity and trade shows were all the marketing required to win. Today, advertising is all but obsolete for most marketers. Collateral is all digital, and trade shows and publicity may or may not be viable communications channels. No question, for leading manufacturers strong branding is still critical, including brand names, logos, messaging, graphic themes. But branding might be more about our next marketing success key, digital excellence. Digital marketing is the new umbrella term for internet marketing, and is inclusive of websites, search engine optimization (SEO), social media, and all forms of paid search. Of course, websites must have a modern image, with intuitive and user-friendly design or user-experience (UX). Websites must also be mobile-optimized or responsive–fancy monikers for viewable on a cell phone. Did you know that search engines are killing small and non-optimized websites? Noticed a decrease in your website traffic and contact form registrations? Lack of organic or free website traffic, or lack of top ranking on a search engine results pages (SERPs) is common for all but the largest manufacturers and websites. Websites with less than 1,000 unique visitors per month are invisible. A key remedy, search engine optimization (SEO). Effective SEO tactics are well-documented, and very achievable. For more information, view our SEO Best Practices Guide. It’s 2018, social media is effective and proven. For manufacturers of business products, social media is more likely about LinkedIn and YouTube vs. Facebook and Instagram. Manufacturers of consumer or retail products know how critical Facebook, YouTube and Instagram can be. So no more excuses, social media drives website traffic. And website traffic corresponds to search authority. Another important aspect of digital excellence is paid search or pay-per-click (PPC). Why? Because paid search can drive web traffic and lead generation. Please do consider other forms of paid search including remarketing, display networks, and social advertising. For more information, link here. To be sure, organic or free traffic is the ultimate goal of effective marketing for manufacturers. Paid search is expensive, and not sustainable. That is, PPC traffic will evaporate when spending is paused, whereas organic traffic can grow incrementally over time. So how does a manufacturer achieve organic? Certainly the aforementioned SEO must be perfected. What else? Content. Not fake news, but effective, educational and interesting (to your target audience) content. Blogging is the foundation of your content marketing program. As mentioned, like all content, blogs must be educational and interesting, and also be posted with good frequency. Rule of thumb is no less than weekly; daily if possible. The more frequency the merrier. 500-2,000 words in length, properly archived, tagged, meta-coded (see SEO link above). Blogs should interlink to other, relevant blogs. Similar blog topics can be consolidated into white papers or guides. Case studies are always of interest to customers. Testimonial videos are even better. A thought leadership brand or entity, sponsored by the manufacturer is the ultimate content engine. Be sure to get some advice on content strategy and planning. Check out some MMP blogs on content marketing. No question, all this effort is focused on lead generation, if not direct sales. So how can a manufacturer achieve more lead generation? First, make sure your website is structured for lead generation. How? Calls-to-action (CTAs) or offers on all pages, blogs, and available website “real estate”. Examples: Register for Email Newsletter, Download a Complimentary Report, Attend an Upcoming Webcast. Have a dedicated “Resources” landing page with Registration forms in front of all educational content. Email is an important aspect of lead generation for manufacturers. Always be researching and developing email lists of prospects by industry, geography, title or responsibility. LinkedIn Sales Navigator is an excellent tool to identify contacts. Hunter is an excellent tool for identifying email protocols. Build large email lists with segmentation codes, as email averages only 10-20% open rates, and only 10% click-thru rates (CTRs) for business markets. Identify multiple contacts in key customer locations. Test subject lines, and study email metrics for open and click-thru rates. Maintain email frequency, no less than monthly. IP tracking is another tool for identifying website leads (see MMP blogs on Email and IP tracking). The ultimate goal of marketing is sales. The aforementioned marketing initiatives and tactics drive website traffic, lead generation, and can support all types of sales organizations, from direct sales teams, to indirect sales representatives, to distributors or channel partners. Sales relationships can be further supported by the integration of these tactics with customer relationship management (CRM), or lead management software. Marketing is also responsible for providing sales teams the tools required for different stages in the sales cycle. Powerpoint presentations, collateral (e.g., brochures, case studies, sales kits), along with competitive comparisons, and training information on how to answer customer objections. Beyond software and sales tools, old-fashioned communication with sales staff should always be considered. Marketing should train sale personnel on how to uncover customer needs, and how to effectively use the many tools developed for different sales scenarios. While traditional marketing was difficult to measure, today all marketing is measure-able, often with detailed dashboards. Website analytics are critical to understanding traffic trends and sources of traffic. Webmaster tools, and other free applications support marketing excellence. Manufacturers must embrace modern marketing, or risk losing the battle to competitors that leverage marketing excellence in the digital age. More than ever before, marketing is critical to the success of manufacturers. 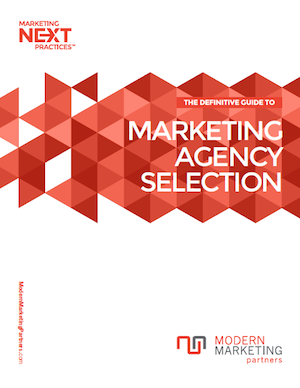 For a complimentary consultation, contact Modern Marketing Partners. Neil Brown is a veteran marketing executive having served as brand manager and chief marketing officer (CMO) for multiple manufacturers. For more than 20 years, Brown has consulted for some of the leading manufacturers in the world including Emerson Electric, Panasonic. USG, Omron Electronics, and others. Author of two books, Neil is published in Marketing News, Advertising Age, Adweek, and more. He earned an MBA from Northern Illinois University, and a BS-Marketing from Southern Illinois University.